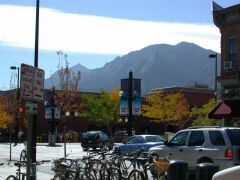 "Downtown Boulder is a uniquely beautiful downtown, surrounded by the stunning Flatiron Mountains with the Rocky Mountains in the distance, the crystal clear Boulder Creek, and filled with wonderful shopping, dining, and entertainment." The Leeds School of Business at the University of Colorado at Boulder has been named one of 10 "Hot Spots" for entrepreneurial education by Fortune Small Business magazine in its March, 2006 issue. is located between Denver and Boulder along U.S. 36 / Boulder Turnpike (for old-timers)up to the north I-25 corridor, past Colorado 7.
located within Boulder County, is a city with 22 square miles, over 300 days of sunshine, and a spectacular view of the Rocky Mountains. Are you looking to start a non-profit organization?